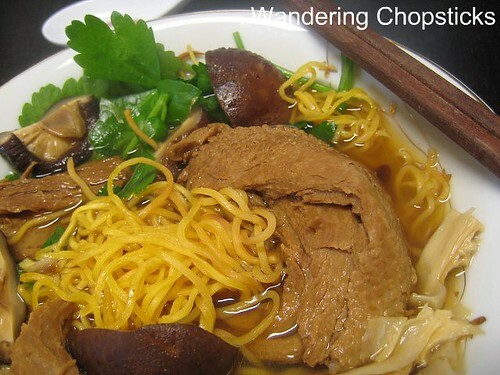 Mi Vit Tiem is a Vietnamese egg noodle soup with duck that's been seared and cooked with Chinese spices. It's not terribly difficult to make, although it does take a while to simmer until the duck is tender. I made a quick vegetarian version instead. 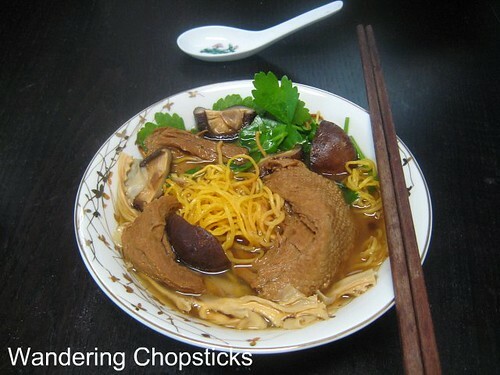 Mi Vit Tiem Chay (Vietnamese Vegetarian Chinese Five-Spice "Duck" Soup with Egg Noodles). But wait, did I forget I was making a vegetarian soup? It looks like I have duck in my bowl? What's that you ask? Look closely at the picture below. It's "mock duck," made from fried wheat gluten. 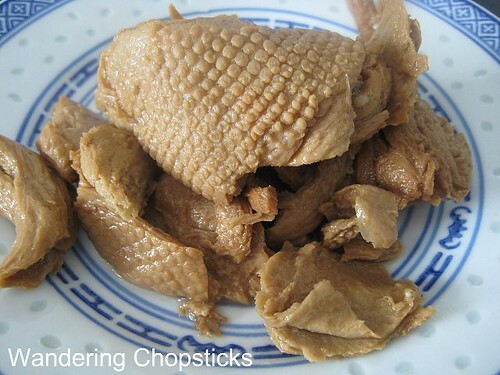 And it seriously has similar taste and texture to real duck meat. 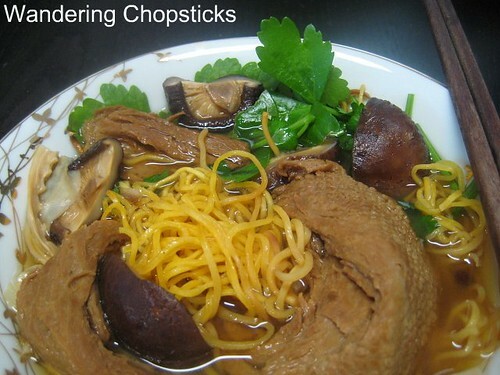 "Mock duck" is a staple of vegetarian Chinese and Vietnamese Buddhist cuisine. In the West, wheat gluten is often referred to as "seitan," but I think the Chinese and Vietnamese versions are much better in taste and appearance. This can was about $1 at the San Gabriel Superstore and provided enough "duck" for a 3-quart pot of soup. The ingredients are fried gluten, salt, sugar, soy sauce, and soybean oil. 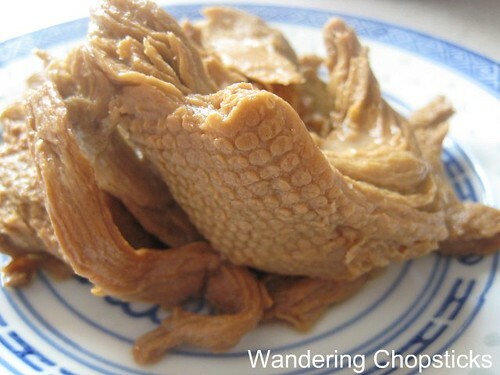 The color and taste is largely derived from being cooked in soy sauce. 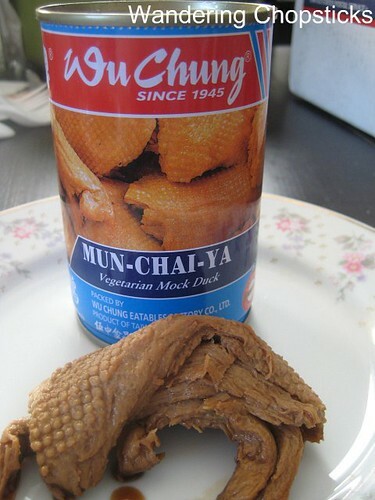 It's ready to eat straight out of the can, but can also be prepared in any dish in which you'd use regular duck meat. See how it even shreds like real meat? So when Wiffy of Noob Cook, host of last month's Weekend Wokking broccoli round-up, announced the MUSHROOM for this month's challenge, I figured it was a good opportunity to make a vegetarian version of mi vit tiem. 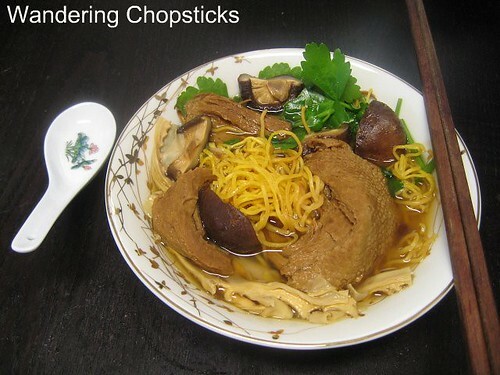 The keys to a flavorful soup are the dried shiitake mushrooms and dried bamboo shoots in the broth. Since this is the vegetarian version, there's much less simmer time because I'm not tenderizing real duck meat. I've added a bit of Chinese five-spice powder to up the flavor, although I used whole star-anise pods too. Fill a 5-quart stock pot about halfway with water and set on the stove to boil. Toss in 1 large onion, 3 star anise pods, the slices of ginger, 1 tsp sugar, and 1/2 tsp Chinese five-spice powder. Soak about 10 dried shiitake mushrooms in hot water for about 5 minutes. When the mushrooms have softened, snip off the stem with a pair of scissors. Wash the mushrooms to remove any excess dirt and slice them in half. Add the mushrooms to the pot. 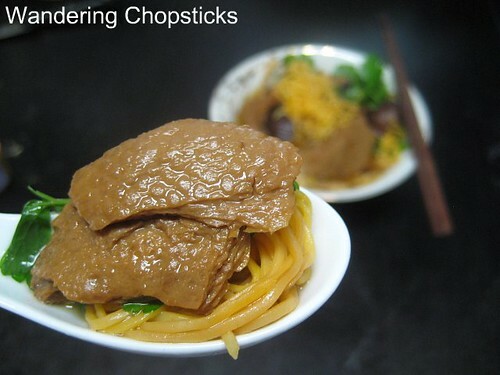 Cut dried bamboo shoots into about 3-inch long pieces and add them to the pot too. Let the stock simmer for about 15 minutes on medium heat. Meanwhile, open the can of mock duck and quickly rinse and lightly squeeze the pieces to remove excess gluten. Place the pieces in a shallow bowl and add 1 tblsp soy sauce. Set aside. The stock should be quite dark and somewhat flavorful by now. Add the mock duck along with any remaining soy sauce from the bowl. Taste the stock, adding about 1 tblsp of fish sauce or more if necessary. Let simmer for a few minutes more while you boil the water to cook the egg noodles. To serve, layer a bowl with the egg noodles. 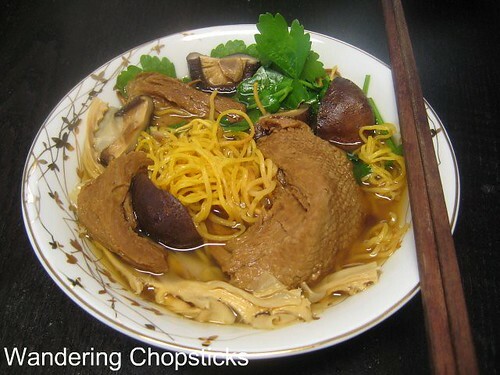 Spoon broth, mock duck, shiitake mushrooms, and bamboo shoots over the noodles. Garnish with whatever greens you'd like. A hearty vegetarian soup. You won't even miss the meat. Who made my recipe for mi vit tiem chay? My College Kitchen said, "...this recipe is good for us, satisfied. I say two thumbs up!!" I'm submitting this recipe to Weekend Wokking, a world-wide food blogging event created by Wandering Chopsticks to celebrate the multiple ways we can cook one ingredient. This month's secret ingredient is the MUSHROOM. 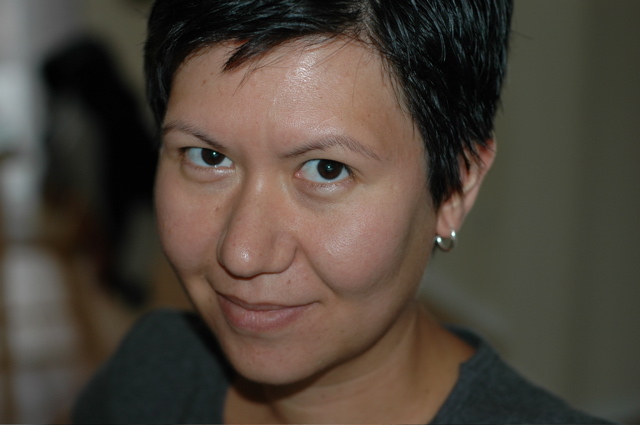 The host for January is Marija of Palachinka. Check out the mushroom round-up for 12 recipes. 1 year ago today, Bo Nuong La Lot (Vietnamese Grilled Beef with Wild Betel Leaves). 2 years ago today, Porto's Bakery - Glendale. I realized there was a catch somewhere with the meat :) I even enlarged the image, but that "duck" was made perfectly. It even has skin! Amazing entry! I had a mock sweet and sour pork at a vegetarian Chinese restaurant before. It was good but I couldn't figure out for the life of me what it was made of. Now I'm thinking fried seitan, like the mock duck. The duck skin look sooo real!!! I had this before but using real duck meat. Very tasty! Thanks for the recipe!! I was just thinking about Mi Vit Tiem the other week. I didn't know there's such a real vegetarian version of the duck - where can I find it? the usual Ranch 99 market? I'll keep this ingredient list in mind next time I do grocery shopping. Way back in the day when I was vego, I found mock meats really strange (well, guess I still do though I like them). Um used to regularly take me to Buddhist temple restaurants where they served up wedding style banquets of meat-free dishes, but all in mockery: cold cuts of gluten, roast mock duck, mock lobster etc. It was amazing, but weird. I don't think I'll find mock meats round where I live! Except for quorn. There's lots of that about. I have seen veggie liver and fish, but never duck! The mock duck looks really real and looks like it has been "cooked" for a very long time. The photos look great! Every color and component is extremely vibrant and stands out. Great shot! I would pay for a bowl like this rather than some bowl of noodle from a hotel in Las Vegas. Many of them are really bad, with a exception of several. My second-youngest uncle said these meats are bad if you're a vegetarian for humanitarian reasons b/c your eyes still see the "meat." Definitely. 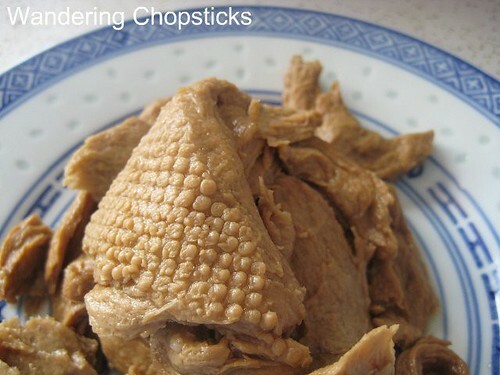 The Chinese do lots of fun things with faux meat. My sister was all weirded out by the skin too. I was amazed at how much the mock duck shreds like real meat. I was too lazy to make it with real duck meat. I guess I could have cheated and used roast duck, but I felt like playing with my food instead. I bought mine at the SG Superstore. I edited the post to include the link. I used to eat vegetarian when I took my ba noi to temple too. It was always good food, even without any meat. Do you want some? There's some dried mock meats I can send you. I know quorn is trendy, but it's also a fungus? I didn't know you worked for a vegetarian company. Very cool! Haha. But yeah, it is a lot of tofu, mushroom, and veggies. The mock-duck looks cute. I love how they stamped it to look like skin. It's strangely compelling. Hee. Yay! Glad you liked it. I like bamboo a lot too, but dried bamboo is much stronger in taste so be careful not to overdo it. Thanks for the reminder. I do have other vegetarian recipes that I still need to post! So glad you and the meat eaters liked it.